Paraguay are through to the semi-finals of the Copa America, having drawn all four games so far. Gerardo Martino took the surprising decision of dropping Nestor Ortigoza, bringing in Victor Cacares in the centre of midfield. Roque Santa Cruz dropped out, with Nelson Valdez making his first start of the tournament. Mano Menezes kept his XI from the 4-2 win over Ecuador, meaning Robinho retained his place on the right. Score this one on points, and Brazil would be the winners. More possession, more shots and more clear goalscoring chances meant they were in the ascendency for the majority of the game. Martino’s tactics took Brazil by surprise early on. More accustomed to sitting back and soaking up pressure, Paraguay pressed Brazil heavily in the opening minutes, denying their midfielders time on the ball, and also paying particular attention to Lucio, to prevent him bringing the ball out of the back. The decision to omit Ortigoza made sense in this respect, because he probably wouldn’t have had the mobility and energy to close down as well as Caceres did. The downside, though, was that Paraguay were fairly clueless when they actually had the ball, with a complete lack of imagination from the centre of midfield, and little contribution from Marcelo Estigarribia on the left. In contrast to Paraguay, Brazil were much more relaxed without the ball. Their front four made little attempt to win the ball back, and Brazil had to build moves from deep. In terms of formations, Paraguay continued their 4-4-2 / 4-5-1 shapethat depended upon the right-sided player, Valdez, acting as a second forward when moves developed. Brazil’s right-winger also played narrow, with Robinho drifting inside and playing some good combinations with other attacking players, as Brazil tried to play through the centre – the area where their two goals in the previous meeting with Paraguay came from. The key battle was deep in Paraguay’s midfield, where Cristian Riveros did a good job nullifying Ganso. As we saw in Brazil’s opening game against Venezuela, take Ganso out of the equation in the 4-2-1-3, and Brazil are a broken side, with no link between midfield and attack. The first half never looked likely to produce goals. Brazil improved hugely after half time. Paraguay’s pressing was no longer so evident, and Brazil passed much better as a result. They got the ball to the wide players on the run, and produced more chances, despite lacking cohesion between the front four – it all seemed improvised rather than organised. That aside, there was a lack of tactical interest in the second half. Neither manager wanted to change things, though considering the fate of Chile’s Gary Medel and Uruguay’s Diego Perez, we should give credit to Martino for withdrawing Enrique Vera, who had picked up one yellow card and was in danger of another. The only tactical changes made things more narrow, disappointingly – Hernan Perez, a winger, came on but played broadly through the middle behind Barrios, whilst Fred replaced Neymar with Pato moving left. Brazil’s tactics became a bit confused at this point, and Fred didn’t have the influence he exerted on his previous substitute appearance. Still, Brazil were the better side in the second half, and some wonderful saves from Justo Villar kept Paraguay in it. The tactical interest, however, was minimal. The double red card – Lucas and Antolin Alcaraz – should have opened things up, but instead simply forced both sides to play more defensive football. Menezes reacted by bringing on Elano for Pato to strengthen the midfield, whilst Martino, having used all three subs, put Dario Veron at centre-back and substitute right-midfielder Edgar Barreto at right-back, with Perez moving to the right wing in a 4-4-1. Both sides sat back and didn’t take advantage of the extra space. The least exciting of the four quarter-finals, where Brazil couldn’t even manage to score from four penalty kicks. Menezes has made some errors in this competition, but it’s difficult not to feel some sympathy for him here. The decision to pick Robinho (the only real choice he had to make) was broadly a success, and it’s difficult to fault his tactics for this particular game considering how many chances his side created, plus the fact that Julio Cesar rarely looked in danger of conceding. Martino continues to use the same formation, but he showed here that he has the ability to vary his tactics. Paraguay were more proactive in the first half, but when they could no longer close down, they came under sustained pressure. for the 1st time in this brilliant website i felt this analysis was somewhat shallow. The most interesting tactical point not mentioned was that Ganso and Robinho understood really well Caceres´role: Ganso carried him away to “dead” zones of the field, opening space for Robinho in the hole. Something i noticed (nothing to do with tactics) watching the replay in super-slow HD was that due to the terrible conditions of the pitch the ball had a little movement just before the action in the penalties kicked away from the spot (Fred, A.Santos and Elano). Could somebody else see this? 2. If there was a problem with the grass (Penalty spot), it certainly had little effect on the paraguan players who converted! paraguay was using the same pitch as brazil, whats the problem here? You could make an argument to the contrary quite easily. Poor conditions make football harder. The harder football gets, the more skills you need. So i think on a bad pitch I would chose the most technically gifted players. Especially the ones that can control a home-made ball with their bare feet on bad terrain,lets say a beach. Maybe a Brazilian? And even if you’re correct. It would only favor the lesser skilled in the sense of levelling the field of play. In other words, everyone becomes just as bad or good. I see no reason why poor conditions would make the brazilians worse than their lesser opponents. And that said. Even when we accepts the effect of poor pitch conditions. It goes to far to explain the missing of four penalties by one side. It might (mind you i’m being generous here) account for one goal, maybe even two on a crazy day. Not four. Other reasons are just more likely. Certainly there was a need for a more creative player instead of Ramires? While I feel his energy and determination are valuable, having both Lucas and Ramires in the same team, while broadly being similar players, is a bit unnecessary. Would have loved to see Hernanes there, especially when other national teams have players such as Pirlo, Xabi Alonso and Schweinsteiger as “second function” midfielders. yep very poor central midfielders from brazil’s standards. Thats the funniest thing I’ve heard ” low 70’s in FIFA (09-11) lol” HEHEEH wonderful! And it’s kinda true also. Yes, it’s some wonderful reasoning, but i think i agree with his point though. Brazils midfielders aren’t as impressive as i would expect. But then again, i find a lot of the Brazil squad not as impressive as i’d expect. Considering the Midfielders performance they could bring Luiz Gustavo if he plays decent in the coming season for Bayern. I cannot see how Ramires or Lucas are any better than him. First of all, this is a Justo Villar game. It would otherwise be a pretty comfortable victory to Brazil if not the Paraguayan keeper in his position. One thing I am not sure is the hype about Ganso right now. He showed talent in some spots in the tournament, but is not the star player in the Brazilian team at all. Maybe we still need a few more years to see how good he is / can develop. Ganso, hasn’t played in 7 months. He played like one game before going to the copa america. In 2009/2010, he was unbelievable and should have been starting in the 2010 World Cup (instead of or with Kaka). Mano used Ganso in this tournament to get him ready for the Olympics and to start building a team. I feel the issue here is Ramires and Lucas Leiva, who were unable to PASS and support Ganso with quality. It’s not so much an “age” issue as much as a “form” issue. Overall, the play was bad(not up to par)…you’re right on your evaluation. One thing interesting about the best Brazilian players in the last 20 years is that they actually did not play main role in big tournament until they got enough bench experience or mature enough. Romario and Bebeto were behind of Careca and muller in 1990. Cafu and Carlos started 1993 Copa but are not starter in 1994 (Cafu (24) was behind Jorginho and Carlos was not selected). Ronaldo was on bench in 1994. Ronaldinho was a sub in 1999 Copa. Kaka played 22 min in 2002. Rivaldo had not started until 1996 Olympics (24) and 1998. There are lots of examples against this but experience seems to be important for player performance in big tournament. Maybe that’s right, but this time Brazil want to build the Future. So their give Ganso, Pato, and Neymar a lot of opportunity to play in this Copa. And i still proud of Ganso, he did a decent job on his first Brazil big tournament caps. Brazil problems are more little than Argentina side. Brazil played too many players from their league. Elano, Neymar, Fred, Ganso, Lucas. The league is too slow. Neymar, Lucas, Ganso weren’t ready. Douglas Costa, Ferdandinho, & Jadson for Shakhtar look much better out there than these guys- going blow v. blow v. Barca. 1. Lucas plays for Liverpool, unless you mean the other Lucas who barely payed. 2. You can understand why the populace and the coach might want to include/reward the players who eschew moves abroad and bring their talent to the national league, right? 3. It’s not like Elano and Neymar play in Brazil because they *have* to. They both have options in Europe but choose to play for Santos. It’s still a fair point. A coach should pick the players he thinks will produce the best results. Maybe Menezes was hoping the Santos trio’s familiarity would make up for Ganso + Neymar’s lack of international experience (both w/club and country), but generally the better players will play in better (foreign) leagues. On an unrelated note I would love to see Menezes push Alves out to left-back for a few games and see what a Maicon/Alves fullback partnership looks like. He might flop terribly when forced to use his left foot, but two bombing fullbacks could lessen the need for (or, depending on your view, cover the lack of) creativity from central midfield and allow the wider players more license to move inside and work some magic. Ganso is not yet the star we all think he’ll be, unfortunately, because he’s very talented and could’ve done better. But let us remember the fact that he’s recovering from a long-time injury (he and Pato almost didn’t make the Copa, Mano waited for them ’til the last minute), that he played a single cap before the Copa (a great performance against USA in the very first game with Mano on charge) and wasn’t called after this mainly because of the injury and that he’s still very young, with the whole squad based around him. Too much of a responsibility for a 21-year-old. Yet, despite not playing so greatly, he still did well, being the top-joint assistant of the competition (so far) with 3 killer passes. Considering Brazil scored 6 goals, he’s responsible for half of the assists. Brazil has recent a history of not appropriately use great playmakers, men that were so good for their clubs who never got a real chance to continue as starters for the national team. The likes of Raí, Alex and Juninho easily come to mind. I only hope that Ganso isn’t becoming one of them. Mano has to insist with him. As some, like Ravey above, pointed well, Ganso needs men around him that help his game with creativity and good passing. 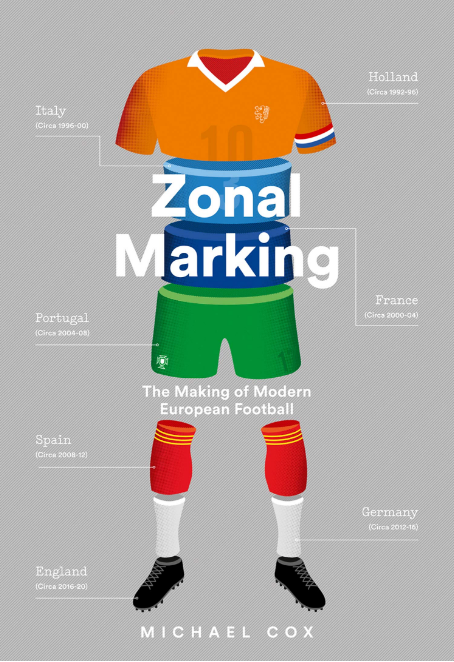 Otherwise, any time a team do a special marking on him, Brazil won’t work. I expect Mano to rely less on the Lucas/Ramires duo and start pitching more creative players like Hernanes and Arouca. Hence the Ganso/Arouca combination being so successful for Santos. Idiotic they would take a player who has not played in 7 months and leave out players who were in great form in European football for Shakhtar and Porto. I have never seen a tournament where Brazil passed SO BAD, especially the first three games. Especially Lucas Leiva, Ramires and Ganso. I understand Ganso is not in the best form because of injury, so I understand him. However, the two stoppers “volantes” did a terrible job CONTROLLING and holding the midfield. They steal, but they don’t run the midfield, thus Paraguay marks Ganso and stops Brasil attack/midfield. The Brazilian soccer player has been over marketed in an incestuous fashion. Now the only thing we have are mere facades of what a real Brazilian player should be. It’s like they are missing a ‘Brazilian soccer chromosome.’ I still have hope for Brazil (as always); however these current players are not even close the caliber (yet?) of Ronaldo, Kaka, Cafu, R. Carlos, Rivaldo etc. Missing 4 penalties – no comment- merely confirmation about them not having a chromosome. Lastly, these players are 21-27 year-old ‘professionals,’ so “youth” isn’t a factor in missing penalty’s or so many passes and goals. They are too young. Pato, Ganso, Neymar, Lucas (the 18 year old one) have never carried a team at this level. There are Brazilian players out there who have. Hulk. Etc. They werent there. Brazil did play a great game, opening it on the wings and keeping a strong presence in the middle. Paraguay plays a sort of “Midfield Catenaccio,” with four guys in front of a DM who acts as a ’sweeper’ covering a very wide area. That ’sweeper’ is either Vera or Caceres. The Paraguay formation can be thought of as a 4-1-4-1, with the wide mids acting as wide forwards in attack, and the DM running to either side, while the two central mids reinforce the CBs in defense. That marks a key difference with most other defensive teams, who use the DM as a third CB in case of attack, and use one or two CMs to cover the width of the field. 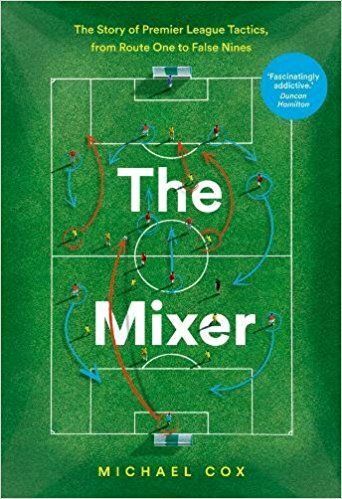 In this case, the midfield sweeper had a very interesting double role: covering holes, and following Ganso, who is the guy most likely to take advantage of such holes. By far, Ganso is the best player of this Brazil, whatever the fame of Pato, Robinho and Neymar. Take Ganso away, and they lose the guy who generates the lethal passes. Valdez was brought in to serve as link between the midfield and the lone forward, Lucas Barrios. However, Tata Martino has planned for the penalties, since in order to score he’d have needed to leave too many open spaces. Valdez-Barrios were there mainly to keep the Brazilians on their toes, Valdez very much able to nullify a subpar Andre Santos. All the best Brazilian chances came from Maicon side. Knowing that Estigarribia was good for the counters but not solid in defense, Martino’s plan was to allow Maicon to run on their left, only to close it down at the last defensive line, where Riveros moved to mark Robinho freeing Torres so he could block any attempt at cross from Maicon. All in all, a tactical game, quite boring to watch. Which is expected of any Paraguay game. I think Menezes bring Elano in the second half of extra time to get Brazil ready for penalty kick. Because Elano was a good set piece taking, But poorly he missed that opportunity. You guys really thought brasil had a good game? I found their way of playing very frustrating with something like false dangerousness (exept their 3/4 real chances): they often got to the last 25/30 metres but did nothing interesting most of the time. - pato as a lone striker unable to anchor the central defenders, it’s like having no central striker exept for interesting runs sometimes, tacticaly it does not suit them (neymar, ganso, robinho, elano played with andre as the central striker in santos, a big powerful presence able to poach not to run everywhere). - their left side does not work: having andre santos as LB is like having a right-footed LB because he prefers to go inside more then outwide, even with neymar going inside next to him. this combined with the right footed neymar coming inside as i said does not work, it’s like they don’t have a left side.And ganso being leftfooted doesn’t balance this either as he’s slow and very central. - Ganso is too lonely, lucas’s passing is quite poor, you can’t build attacks with ramires, and robinho & neymar are not playmakers either and are quite similar, liking to go between the lines behind a big striker. So the lazio guy or elano or jadson should be starting to help ganso to really make assaults and not just let him do the best but not interesting enough pass. So i think brazil should play fred or a player with anchoring presence, play a left footed winger staying left or at least a LB staying wide, choose between robinho and neymar (easy)and play the lazio guy instead of lucas/ramires. If jadson was leftfooted or playing like required on the left side it would be easy and perfect. Totally agree with your 3 points, especially the first two. I couldn’t stop complaining during the game that André Santos was drifting too much inside, instead of staying wider and providing overlaps. I do approve this analysis too. Indeed too bad that Andre Santos was getting inside the teeth of the defense all the time because he makes pretty good crosses when he remains on his side! I found that Ramires had a pretty good game though. He mad sharp defensive interventions and some nice runs too. 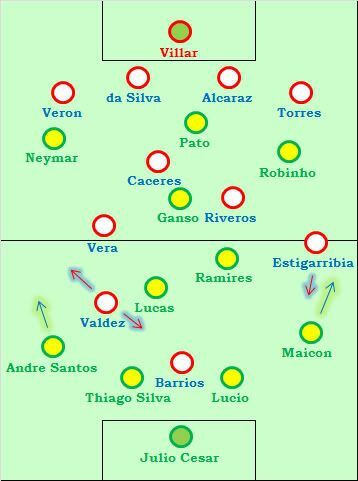 But it is true that Brazil was lacking creativity which was limited to only one player, Ganso, and Robinho at times too. To me, i’d like to see Brazil playing in a 3-4-2-1-ish system : it would give total freedom to the wing backs, capitalizing on the very good players of this type Brazil have (Maicon, Dani Alvers, Marcelo). I’d see Ganso associated with Ramires as the 2 CMs : a bit of a risk as Ganso won’t make a big defensive job, but Ramires is so amazing running every where that it may be enough defensively. And enventually, Pato would have more space and freedom in this system, rather than surronded by 3 offensive midfielders. Is there a more boring team in international football than Paraguay? Four draws in four games in this Copa ffs, and in South Africa they just won once. I don’t see one exciting/creative players in the lineup. You can call this boring or whatever, but this is a team with a consistent system. They have played consitent football since they really showed up in the world in middle 1990s. with good defenders and keepers, hard-working midfielders and prominent strikers. They do not have the most talented players but they always play up to their limit. You do not have to like their style but you should respect their football. Are you serious? 2 of the draws were the result of late goals, one of which Paraugay was up 3-1 in the 89th minute. The other a last gasp effort by Brazil to tie them after Paraguay scored 2 unanswered. Let’s face it–the soccer played in this tournament has been dreadful. The only fun part has been when the Univision announcer yells “what a miss” (in Spanish of course). He must be losing his voice by now. The lady’s game is inconsistent and different, this owing to the slower player speeds and turning abilities; but on the whole, the US/Japan finale was far more interesting to watch–and with good sportsmanship (no diving, play acting, etc.) besides. For the Women’s World Cup, the main tactical point was that Japan foolishly matched the USA’s flat 4-4-2. Since both teams played the same shape, the American’s superior athleticism allowed them to overwhelm the Japanese for large portions of the game. The Americans dominated the transitions for most of the game, and Japan really couldn’t deal with the half press of the US. Japan had no presence in the hole, and had to rely on Homare Sawa playing balls over the top (a few of which were outstanding and deserved better finishes). The USA played toward Abby Wambach most of the time, and Wambach had a few great chances. She also dropped deep and allowed young second half substitute Alex Morgan to chase balls over the top to good effect (her control and finish for the first were stellar). On the whole, the Americans dominated and created far more chances than the Japanese (the US hit the woodwork 3 times). However, the defense committed several costly errors in the run up to Japan’s first, and Sawa’s acrobatic volley was an excellent second. womens “football” what a bunch of feminized pussys you are for watching it. It almost seems like the women’s USA side mirrors the men’s in that they play with so much more vigor and determination when they’re tied or behind a goal. Once they get ahead something just goes missing and plays get sloppy and chances go begging. Japan struggled quite a bit in this game, especially compared to game they they controlled vs. the similarly physical Swedish. And the USA struggled much more vs. the similarly possession-based French. I was expecting a much more even contest than the dominant, yet ultimately wasteful performance from the US. I really dislike Paraguay, every game i have seen of them they all ways seem so defensive and I have never enjoyed watching game when they are included. I wouldnt even mind if they didnt play a passing game and played a more direct game, but just got men forward once in a while to support the strikers, who seem to have more defensive responsibility than attacking responsibility. So once again a team has gone out very unfortunately, Brazil were by far the best team, but couldnt score, and they were horrific in the penalty shootout. This shows to me a lack of team spirit, which is all down to Menezes who i dont rate too much, he hasnt really got them playing as a team, tho to be fair they havent beeen playing together for too long and this is a long-term plan, but this is probabaly the most important thing you can do as a coach, get the team playing for eachover and create a almost club feel to the national team (ironically what Dunga did for brazil, but was sacked for it). There isnt much to criticise here for Brazil except there finishing. BUT throughout there tournament and in this game there has been some players i wouldnt have played or thought were being misused. First i think andre santos has had a poor tournament not really defending well, yet not producing any sort of width to the left side of the attack, now off the top of my head i would have said player Marcelo, but i have heard many stories about his lack of respect for Brazil, so instead why not michel bastos?? he played at the world cup right? i didnt think he was that bad, didnt have a great game against robben, but i would played him, who is great going forward, but pretty solid as well against most teams. Secondly, i wouldnt have played lucas, i think ramires brings good energy to Brazil so i would partner him more of a deep lying playmaker, who played as the deepest midfielder and tried to intercept any balls into his zone, and then use ramires’s energy to cover for him further up the pitch. Ramires also makes good runs forward, which is why i wouldnt play lucas with a playmaker because they would both play too deep. Fot this position i would play hernanes, and i dont why he wasnt in this squad, is it purely because he got sent off against france?? Thirdly, i wouldnt have used pato as the main striker, he would be much better on the wing i think, and from the squad picked, would played fred, to give brazil another option, and to help occupy the CB’s. But i would have included Leandro Damiao in the squad and given him the chance, especially as this is supposed to be a young squad preparing for the world cup. How is that half the posts here are criticizing defensive teams? Look at the players on Paraguay and their clubs. Then look at Argentina and Brazil. Attacking talent worth 40 million euros a player that teams like AC Milan, Chelsea, and Real Madrid are drooling over. Paraguay has scattered players in Europe, a few in Turkey, some in Argentina, etc. Literally what do you expect? It would be idiotic for Paraguay considering their players to play a style of play that does not suite them. Did you see their celebration? Ironically Brazil celebrated like madmen when they scored against Paraguay in the first game. Now Paraguay finished a game without conceding late. I hate to criticise young inexperienced players, but Ganso doesnt do enough in my opinion, particularly off the ball. His passing and control is awesome but it is wasted a lot of the time because he either doesnt bother or it doesnt occur to him to move into a suitable position to receive the ball. It’s a shame to see both Argentina and Brazil knocked out of the Copa America, I for one was hoping for a repeat of the 2007 final. It’s surprising that Brazil were so poor from the penalty spot, usually their players are technically good enough to convert from the spot more often than not. Brazil were z better side. as ZM said if it were on points Brazil would win 9-1. z only problem was finishing and goal scoring which is z most important one. many expected to c more from Ganso. but he’s away for about 7 months and again got injured n was out for 3-4 weeks. z only reason Mano picked him was to build z team around him and to get each other with z other players. otherwise z first match for Ganso against USA, he was incredible cause he was inform. i still don’t understand why Hernanes was left out and why Elias was there. cause Hernanes plays both as CM and playmaker so he’d help Ganso alot better. the other problem was z brazilian players don’t shoot on a goal.it was only Jadson who did and he scored too. Hernanes uses to shoot balls on goal so he’d be very usefull. so i think this Bazilian side has a great future in time for 2014 world cup with more talent,tactic,n expirience in z time. hope Hernanes n Leandro will be chosen for z germany match on 10th august. does anyone know wherabout of CARLOS EDUARDO WHO PLAYS IN RUBIN KAZAN? (please give me a relpy about this guy) when Ganso was injured he steped in against Iran n Ukrain and did a very good job. i still don’t understand why Dunga left Carlos Eduardo n took Julio Baptista instead? I mean its really easy to scout wingers or forwards with so called “talent” because its much more obvious when you see the displayed trickery, pace or what not. The only problem with Ganso is that he is too young, inexperienced enough to make the right movements (especially at international level), not yet able to read the game clearly, its more a mental workout and experience than it is about “talent”. In my opinion, Brazil should’ve used a more experienced player in this position. When was the last time you saw a 21 year old player “directing” the attack perfectly for a team as huge as Brazil in the modern game? Mesut Ozil, in last years world cup? Although he got a lot of help from Schweinstieger, and I totally agree with your point. Germany played almost exclusively on the counter. Different to direct the attack with a team trying to play on the front foot/possession like Meneze’s Brazil. I would guess that Ganso was asked to play higher up the pitch so that the front three would not be isolated. This is a tactical error in my view. He needs to be moved deeper so that he can set the tone with crisp ball movement in the middle third. But to do this he needs DM’s who are more associative. Ramires despite his dynamism just does not link up well enough. Lucas has a much better short passing game but maybe lacks the creativity and intelligence. 1. Andre Santos was awful throughout the entire tournament, providing little to no width and support on the left side, and his defending wasn’t much better. I think Mano should’ve tried playing Dani Alves at left back or even David Luiz, who has played there before. 2. The Lucas Leiva-Ramires duo in midfield just doesn’t work. The build-up play was way too slow in most games (especially in the first half of the Ecuador game). On top of that, Ramires rarely made the forward runs he used to make for Cruzeiro and Benfica, and sometimes for Chelsea this past season. Lucas Leiva, who had a very good season this past year, looked like he didn’t know how to play forward passes and instead looked content to just play the ball back to the back four, and he didn’t do a very good job of covering the space in front of the back four in any of the games in this Copa America either. David Luiz would’ve been a far better option as the holder in Lucas’ place and I don’t understand why Hernanes was not in this Brazil squad. 3. I thought Mano’s substitutions were pretty useless and hurt Brazil, something which the media here in Brazil think as well. Although Neymar and Ganso weren’t having a great game, they’re players who can change the course of the game in an instant, and following Ganso’s substitution, Brazil seemed even more broken and played worse. Another thing that puzzles me is why Mano needs two holding players against a Paraguay side who managed to have 3 shots the entire game. Ramires is not a natural holding player, but surely Mano could’ve subbed him or Lucas Leiva off and brought in Lucas or Jadson much earlier in the game. About the penalty kicks? Yeah, they were embarrassing. i thought similar in my earlier comment, what do you think about playing michel bastos at left back, i liked him at the world cup and could provide good width down the left hand side. Also i agree about hernanes not being in the squad and i think he should have been a starter, a player with a great range of passing and can control the game, unlike lucas who seems content to do the simple stuff of keeping possession but never really gets a grip on the game, which is what brazil needed, espicially as Ganzo didnt seem capable yet of doing that. My team would have been: cesar, alves/maicon, lucio, silva, bastos, hernanes, ramires, ganzo, neymar, hulk, damiao in a 4231/433 with ganzo dropping back into deep midfield to help control possession if needed. Yeah I like Bastos as well. Even though he’s more of a left winger than a left back and his defending isn’t very good, he’s a far better option than Andre Santos and would’ve provided Brazil much needed width on the left, which in turn would also have enabled Neymar to be more effective. I also agree with most of your line-up, especially with Hulk, who was great this past season, though I’m not sure if Damiao is ready to start for Brazil yet. However, I don’t think Pato is that effective playing upfront on his own, so I think that someone like Luis Fabiano would’ve been more effective (too bad he’s injured). Truth is, Brazil have never filled the void left by Ronaldo, and although Adriano looked like the solution, he’s had many problems. Fabiano was great for Brazil, but i feel he has let his standard drop since the world cup, like he saw it as his last chance. I only thought of Damiao because Brazil are looking forward to the world cup, and lack a great striker, so why not bring him in and mould him for the world cup. I agree with you and I think your point 1 and 2 goes hand in hand and really reflects a similar problem. I wonder why Marcelo, Fabio & Rafael of MU were not selected? Anyone has the answer? What about Alex, Anderson and Coutinho? They are quite good in club level, aren’t they?